It makes me want to spend hours hiking around the wild spaces, looking for all these plants. This is the perfect time of year too, with all the plants sprouting and blooming — so much to see and explore. Reading through the book, it amazes me for some reason how much food surrounds us. Eating lots of different leaves for salad greens, making flour out of roots and seeds, making tea out of dried flowers. I’ve got quite a few edible plants in my yard (things I planted), but it’s reassuring to know that the boundary of edible wildness (what most people call “weeds” because there’s a grocery store up the street) extends infinitely. One thing I want to commit to experimenting with this fall is acorns. We get a ton of them on the ground near our house and I’d like to read up on them, find some recipes for processing and making tasty stuff out of them. Okay, well “The Best” is always a relative term. But wow. It was pretty cool. She left at the break (midpoint of a two-hour class). Nice lady, but not into it. The two students who were left have a smidgen of “word nerd” about them, they obviously like and want to learn Spanish and are very willing to stretch out of their comfort zone and venture into new language territory. We worked on talking about “what time is it?” for a bit, because it is our second-to-last class and I feel like that is something really useful for them to know. We were able to go off on a tangent about three different ways to say “time” in Spanish (hora, vez, tiempo) and the specific meanings and scenarios in which one would use each (I LOVE to get into details like this!) It reminded me of teaching French and having my word nerd students ask me amazingly wonderful tangential questions about the roots of certain words, how they relate to English and Spanish and *BLISS*!!! I am in paradise. So it was just the three of us, and I suggested (I’m sure there was a gleam in my eye) that we do an exercise that one of the ladies had done in class before, where they choose one of the photos-cut-out-of-a-magazine-and-laminated-onto-a-card cards and make up a character based on the person(s) in the photo. In class so far we have learned how to talk about what someone’s name is, their age, their family, what activities they like to do and adjectives to describe their personality. We’ve worked on asking people questions to find out this information. So the last half hour of the class (and the details of the exercise were entirely their idea!) consisted of these two students randomly choosing a picture and then challenging themselves to come up with details about the person, presenting these details orally as they invented them. Conjugating verbs, remembering adjectives, recalling how to phrase things like “she has to” do a certain activity or “she likes to” do something or other. My whole job was to occasionally correct them (which they were completely open to, it was fantastic!) as well as to provide the occasional word that they were struggling to remember. Also, I would ask questions about the characters they were inventing, to try to extend the game a bit further, when they seemed unable to generate more raw details on their own. It occurs to me as I write this that most readers would think this was boring as sh*t. I apologize. I know I’m a total language geek, I freely admit it, embrace it, live it. But this was so damn cool you don’t even understand. If we could have every class like this, and we could meet a couple times a week, they would be fluent so fast. They were just swimming in the words, splashing around in meaning, engaging their imaginations with their visual perception with their understanding. I’ve designed my 3 hour budgeting class to lead up to the fundamental exercise: actually working on a budget, with real numbers, needs, dilemmas. One problem: the people taking the budgeting class currently have almost no income to budget with. Let’s figure out how to make gold out of straw? Or, what I came up with on the fly with my one student last week: Let’s pretend that you finish school and become an office manager, and let’s pretend (because I truly have no clue) that you would make $30,000 a year. We both agreed that her salary might well be more than that (I am going to look up some common jobs and their average salaries and have that info on hand next time). We both liked the idea that we were being very conservative to see what things would look like with a possibly less-than-actual amount of money. In the back of my mind I was thinking, not only look up some average salaries for common jobs, but also look up the national average income in general. The budgeting exercise went off brilliantly. I think it not only gave her good practice in sitting down with an income limit and trying to make her expenses, desires and dreams fit inside of that limit, but also just the act of pretending to have that kind of power and choice made her believe (“make believe”) that it was within her reach. Having been poor my entire adult life, I understand the depths of despair a person will have to slog through, and how every shred of hope is torn off as the thorns of reality scrape one raw and down to bare bones. I understand how valuable it is to regain the belief in oneself and in the future. I think part of this class needs to be about starting that emotional recovery, in addition to gaining the skills and information to achieve financial health and stay there. So now it’s time to take my impromptu experiment and develop it. I figured if I used the national median income I could justify the number I used as well as simplify things by having each student working with the same figures so we could kind of compare notes and things. I found it here: U.S. Census. The median annual income for the United States of American is around $50,000. Holy f-monkeys. Rounded off, that’s about $4,000 every freakin’ month. Cripes. There’s no way in hell I can use that number. Am I just jealous, because our family can’t seem to get near that number? Or after all these years, do I think that it’s an impossible figure, and in applying my own lack of faith, I’d be holding my students back from achieving something that obviously a TON of people are able to achieve? Or do I just not want to give them a shot of hope that will get them SO high that when it doesn’t look immediately possible, they will throw out everything we’ve discussed, even the reasonable, helpful bits? How can I justify using $30,000? Because it’s a number I’m intimately familiar with? Because it gives one a modest little $2,500 per month to work with? Because it’s most likely a believable, and inspirational, step up from where they’ve been for years? I’ll have to do more investigating. And more experimenting. I just realized that everything about my job teaching these continuing education classes is great for the Buddhist path. One class is over every 12 weeks, with no guarantee that I will get to teach another. The other is essentially week to week, without guarantee. And so in my Spanish conversation class, I can tailor lessons to the needs of these particular students. In the budgeting class, I can focus on whichever topic my current students are struggling with, or spend more time filling gaps in certain areas of knowledge. There are no tests or grades (unless we decide we want some!) so I don’t have to waste time passing impersonal judgments when I can very well hear and observe in which areas they need more help. My Spanish class in particular WANTS to be learning the subject matter, and so it is just a matter of being available to them and guiding their progress. No need for me to “objectively” evaluate (as though such a thing were possible) and then classify along the spectrum from genius to moron. They are each just a student walking their path, hanging out in class and engaging with the material for a while. I also have the freedom to be the instructor I feel like being that day, whether I’m in more of an entertainer mood, bouncing around the room cracking jokes, or if I’d rather get more in depth, tie in relevant ideas that give the class a more serious tone and encourage students to reconsider fundamental assumptions that might be unhelpful to perpetuate. In short, other than staying within the general subject matter, teaching these adult education classes seems to be inspiring a very unattached career. And with no benefits, no tenure, no job security, no 401K or health insurance or any other long term advantage, what better way to live in the now? Okay, I’m being sarcastic with that last part, but definitely trying to look on the bright side with the rest. Well, apparently I am able to successfully convey information about financial planning in the Spanish language for a couple of hours. I’m supposed to get it up to three hours, but that is going to involve adding topics, I think. Although today’s class may not be an entirely accurate gauge, since my only student was a very bright lady who seemed to simply be experiencing situational difficulties rather than requiring assistance due to personal financial incompetence. So when I have a larger group and some of them have some questions and need things elaborated, it may be that the material we have will go further. I look forward to facilitating the first English version next Wednesday. 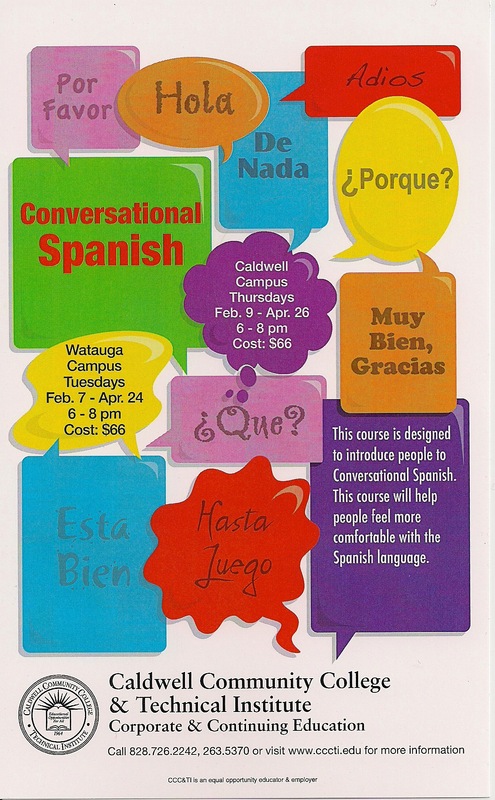 The Spanish conversation curriculum I’ll be using is something I developed and have taught twice before, but it was within an even more informal arrangement teaching private church groups. LOTS of fun (and they seemed to enjoy it too! :D), but after the ten weeks were up they also seemed content to move on to other things. I want to create addicts. I want them to love Spanish, to feel like they are gaining incredibly useful tools, to see that they are acquiring keys to new worlds. I know, I’m a word nerd. The Geek of Speak. We are few and far between. I should consider myself lucky that I get this chance to stand up in front of a group again and spread the language love. But you know, there are a lot of ways to get people hooked. It doesn’t have to just be on the language. It could be on the camaraderie, on the entertainment value. It could simply be that people come to feel like they are actually accomplishing something, and want more. Especially since we don’t have grades or tests, and they won’t get any “credit” on a piece of paper for having completed our class, I have to work especially hard to let them know when they’ve succeeded. I have to make it obvious that what they acquire at the end of a lesson is infinitely more valuable than receiving official approval from an institution of higher learning — when you’re face to face with another human being who happens to speak a different language, you can waggle a piece of paper at them showing that you’ve successfully completed some accredited course, but it’s much more important to be able to actually communicate. I am obsessed. (Less necessary words were never written.) I need to just calmly prepare, then let it go. If this is the last time I ever get to teach Spanish, or anything else for that matter, let me just enjoy it, and make it the best class I can for whoever my students happen to be. It doesn’t have to turn into anything else, doesn’t have to make me the area’s go-to, beloved continuing ed instructor. It always gives me a little thrill when my program director makes these up to hang around town. We’re gonna have FUN! Later on at home, he was talking to a neighbor kid who had come over to play and said something about “when we were at my Mama’s work.” It’s been a long time since one of my kids has used that phrase. Another little thrill.